Ben is now in his second stint at NHG Timber Ltd having previously worked for the company between 2007 – 2012. Ben came straight from university to NHG and learnt his trade under the guidance of our previous MD and founder Nick Goodwin. He moved on to pastures new in 2012 to work for one of the major importers in the UK. This gave Ben an insight into working for a big PLC company whilst also learning to sell from stock rather than just back to back trading. 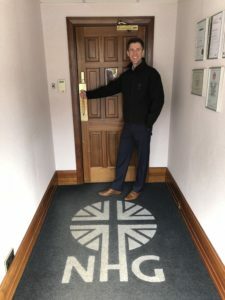 Ben continued to hone his expertise in the Far East supply area, whilst also branching out into selling the whole range of imported hardwoods into the UK. Here at NHG Timber Ltd we knew that with Nick’s retirement we needed a fourth trader – with this in mind we approached Ben to see if he would be willing to return to the fold and help us develop and move the company forward under its new ownership. Having now been back at NHG Timber Ltd for nearly 5 months we asked Ben a few questions about his time away, the reasons for returning and experience to date under the new management team of Guy, Ben and Stuart. What and where was your role during your time away? I was working as a hardwood trader at a large UK timber importer. My main roles included hardwood pack sales and the procurement of Far Eastern hardwood and hardwood products for the group. How do you feel your time away has helped you develop? Upon leaving NHG in 2013 I departed with a wealth of industry knowledge, having been tutored under the enthusiastic guidance of Nick Goodwin. His experience and invaluable mentoring put me in a position to progress to the next stage of my career. I was presented with a fantastic opportunity to further broaden my knowledge of the trade, by working for one of the longest established timber importers in the UK. Through working in pack sales, I gained a much better understanding of what drives the demand for certain species, and particular specifications. I worked under a manager who allowed me to grow and develop in my role, and this helped me become more independent in my work and more confident in my decision making. What was it that attracted you back to NHG Timber Ltd? I was excited by the prospect of managing NHG’s well-established European Oak business, and working for a young and dynamic board of directors that are keen to continue moving the company forward. I was also drawn by the fact that so many of the traders’ assistants, shipping and administration staff were the same colleagues that I had worked with during my previous tenure. This highlights NHG’s stability and seeing so many friendly faces made it much easier to settle back in upon my return. What do you enjoy most about your new role at NHG Timber Ltd? Other than working with such a great team?! For me it has to be taking over the reins on NHG’s European hardwood business. A fantastic supply base has been built up over the past decade, which meant I was able to inherit established business partnerships, and therefore really hit the ground running and be busy from day one. I have really enjoyed getting to know both our buyers and suppliers, and work in partnership with them to further develop relationships and business opportunities. What are the big changes you have seen at NHG Timber Ltd since returning? The core values of the business remain the same, and that is important, as it is key to the company’s continued success. However, the major change that I have noticed is how every member of the team is encouraged to share their views and opinions, which are all listened to and considered. This creates a working environment where everyone feels valued, and can see the importance of their role within the business. Dress down Friday was also a welcome change! I am lucky enough to have a portfolio of clients and mills that I enjoy working with, and I hope to strengthen these partnerships further, as well as continuing to learn from their shared experiences. My main goal must therefore be to maintain and nurture these vital relationships. On top of this I hope to further build on NHG’s presence in the UK market for Far Eastern hardwood products, by using the knowledge I have built up in this area during my decade in the trade. Those that know me will be aware of how much I enjoy eating, and with this hobby in mind there are few better places to travel in the world than Italy! Having said that, I have been travelling to Asia for the past 10 years and have built up some strong business and personal relationships over this time, so I always look forward to my Far East trips. Travelling is a real perk of the job, and I consider myself very lucky to have been able to see so much of the world in this way. What is your favourite species? At the risk of upsetting every one of our suppliers in Malaysia and Indonesia, I would have to say European Oak! Whilst a clear Prime grade is beautiful for its faultlessness, for me it is the imperfections of European Oak that make it so interesting. I have been really encouraged by how the industry is importing a number of grades which show off the character of Oak, as for me this is where its beauty lies. Every piece is truly unique!